but wen i using listen to this device i can hear a sound from mic and while testing sound speaker also working. please help me? Also check under the control panel, Sound and Audio setting the default device is not empty, if it is select the appropriate device. Hopefully that will help you to get this issue resolved, however if it doesn't work would request you to reply with the following info. Since how long have you been facing this problem? Was there any update /new sotware that was installed on the system? Is it only not working online or its not working even if you use any playback music and recording? Its not working online other wise ok. For online i neeed to use head set?????????? Look on the Sound properties Recording tab. 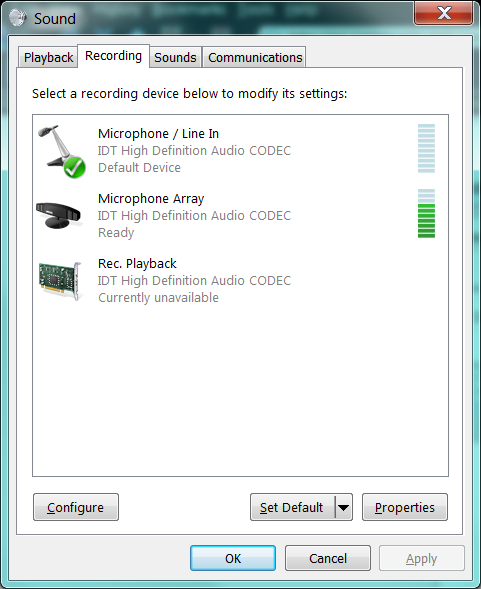 Is Microphone/Line In IDT High Definition Audio Codec selected as the default device? For online i neeed to use head set?????????? Not sure if I understand. 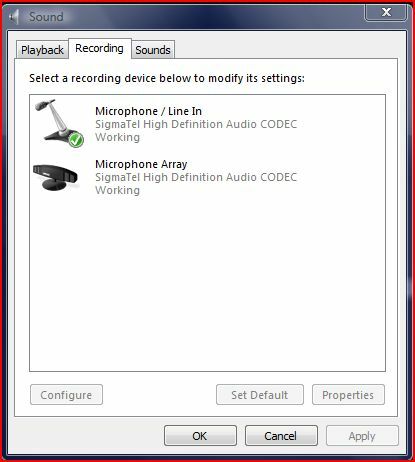 If you do NOT want to use headset then select Microphone Array IDT High Definition Audio Codec and set it to be the default device. I have Dell Vostro 1400 windows vista 32 bit. The built in microphone does not work nor the external one (headphone mic). In troubleshooting window everything looks fine & working. When I speak in the sound recorder the sound bar does not move up. For the external mic, go to the Sounds properties Recording tab and select "Microphone/Line In Sigmatel High Definition Audio Codec as the default recording device. If you just see "High Definition Audio Device" and not "Sigmatel High Definition Audio Codec" then the Sigmatel audio driver is not installed. In that case install the Sigmatel R171786 driver. 3. Select "Show Disabled Devices"
5. Right click on "Microphone Array" or "External Microphone" and select "Enable". 6. Set to be the "Default Device"
To set the levels of the mics or to mute/unmute, select one of the device and click "Properties". 4. Click Webcam Central to start the program. 5. In the lower right-hand corner of the Dell Webcam Central window, click the drop-down arrow next to the picture of the microphone. Select Microphone. Make sure it is not muted. Hi I am also having an issue with my old Dell Inspiron 640m. The Audio is Sigmatel High Definition. I upgraded my OS to win 7 and it works fine though not advisable for this type of model. All of a sudden my microphone did not work. So I tried system restore no go. So I downgraded my OS to Vista 32 thought that mic would work but apparently its not working still even my usb webcam with microphone is not working as well. I can see my mic in the recording tab however its not receiving any signal only buzz and static sounds. I reinstall the Audio driver still not working on the Recording Tab it shows both mics are working but not picking up any signal. I tried the control panel to setup the mic but its not detecting it the Green bar is not moving regardless of which mic option I should choose. Tried it on Skype still didnt work. Is there a way that I can resolved this issue? Thanks. All of a sudden my microphone did not work. Hello. Was that the external mic? This has not come up in years but in my old notes I had written that the 640m did not have an internal mic. Back in those days most of the Dell laptops did not have them but some did and I tried to keep track, but I could have been mistaken about some of them. For the most part the manuals did not indicate it so I had to depend on information supplied by owners. > download and install the Notebook System Software and restart. > download and install the Intel Mobile Chipset Software and restart. 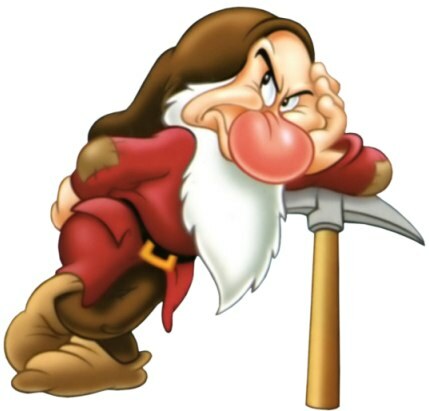 > re-install the Sigmatel R171788 audio driver and drivers of any other devices that don't work. In Sound properties set a mic to be the default recording device. Open the Windows Sound Recorder and configure it for mic recording and then do a test. Alternatively run the mic tests in Dell's PC Checkup. If still not working it could be a hardware failure. Surely you no longer have the Dell Diagnostics on your hard drive but back then the laptops shipped with a Utility or Resources cd with the Diagnostics on it. The tests included a mic test for both internal and external mics. The difference between these tests and PC Checkup tests is that failure in Dell Diagnostics means a hardware failure, but in PC Checkup it could be software because it uses the installed drivers and Windows.